Tom MacGregor earned his M. Div. at Covenant Theological Seminary, St. Louis, MO in 1983. He is endorsed by the Presbyterian Church in America. 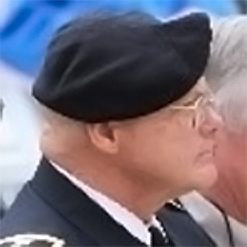 He joined the US Army Reserves in 1980 as a Chaplain Candidate and entered active duty in May 1984 where he served as the battalion chaplain with the 3rd Battalion, 4th Air Defense Artillery Regiment, 82nd Airborne Division at Fort Bragg, NC (1984-1987). He then served overseas with the 558th US Army Artillery Group, Elevsis, Greece (1987-1990). June to December 1990, he attended the Chaplain Officer Advanced Course before reporting to Fort Riley, KS with the 2nd Battalion, 16th Infantry Regiment, 1st Infantry Division (1990-1992). January to May 1991, he deployed to Southwest Asia (Saudi Arabia and Iraq) in support of Operations Desert Shield/Desert Storm/Desert Calm. In July 1992, he assumed duties as the 937th Engineer Group Chaplain (1992-1994) and participated in the Hurricane Andrew Relief Operation in Homestead, FL. In June 1994, he reported overseas to the 501st Corps Support Group, Republic of Korea (1994-1995). After thirteen months in Korea, Chaplain MacGregor moved on to Fort Stewart, GA where he served as the Division Support Command Chaplain for both the 24th and the 3rd Infantry Divisions (1995-1998). In August 1998, he returned to Fort Bragg to become the 505th Parachute Infantry Regiment and 3rd Brigade Chaplain, 82nd Airborne Division. From July 1999 to December 2001, he served as the 16th Military Police Brigade Chaplain, Fort Bragg prior to reporting to Korea a second time in January 2002 where he served a year as the 8th Military Police Brigade Chaplain. Upon his return from Korea, he became the Fort Bragg Chaplaincy Resource Manager prior to assuming duties as the Deputy Corps Chaplain, XVIII Airborne Corps. January 2005 to January 2006, he deployed with the Corps as part of Operation Iraqi Freedom and served in Camp Victory, Baghdad, Iraq as the Multi-National Corps – Iraq Deputy Command Chaplain. He then received an assignment in May 2006 as the Deputy Command Chaplain, First Army, Fort Gillem, GA until his departure for Germany in October 2007 where he served as the 21st Theater Sustainment Command Chaplain. In June 2010 he returned stateside to serve as the Fort Benning Garrison Chaplain, and has recently retired. His deployments include Operations Desert Shield, Desert Storm, Desert Calm, and Operation Iraqi Freedom. His awards include the Bronze Star Medal; the Defense Meritorious Service Medal; the Meritorious Service Medal with six Oak Leaf Clusters; the Army Commendation Medal with two Oak Leaf Clusters; and the Humanitarian Service Medal among others.